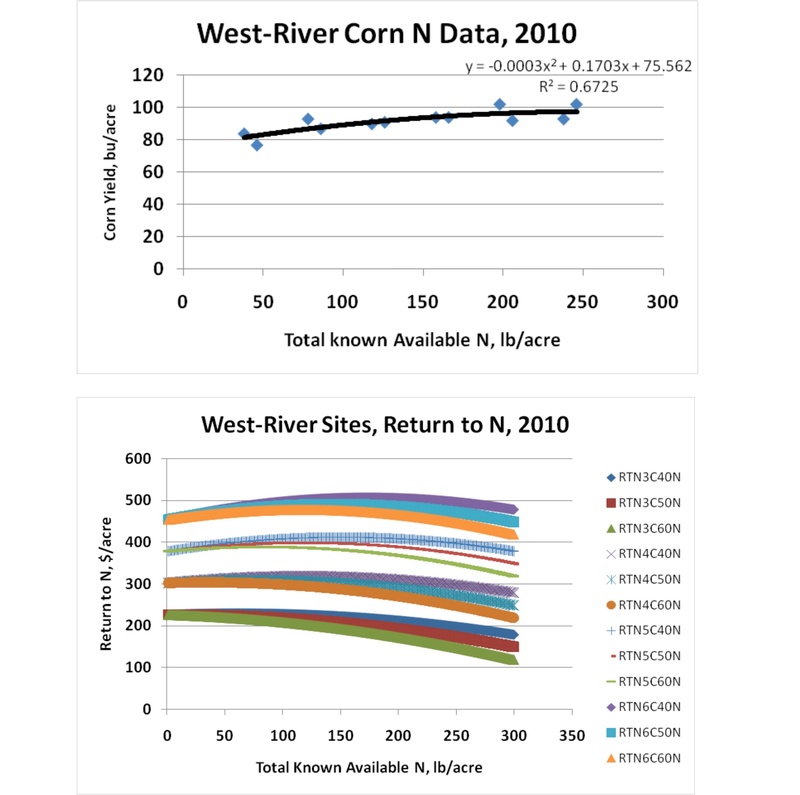 This is the second year of the project constructed to allow the research-based reevaluation of the corn nitrogen recommendations in North Dakota. A total of twenty-two sites were planned in 2011, with 18 to be managed by Dave Franzen in the east, 2 to be managed by Greg Endres from the Carrington Research and Extension Center and 2 west-river to be managed by Roger Ashley from the Dickinson Research and Extension Center. Due to the extreme wet conditions in the spring through early June, the sites west-river were not seeded, one of the sites in the east were not seeded, one was seeded, but the stand was so poor that it was abandoned early, and one of the earliest seeded sites suffered greater than fifty-percent green-snap in June and was abandoned. One of the Carrington sites suffered severe hail damage in late June and also had to be abandoned. A total of 15 sites in the east and 1 site near Fessenden were harvested for yield. With the sites from 2010, there have been a total of 36 sites that can be evaluated. In addition, sensor readings using both a Greenseeker (N-Tech) sensor and a Holland Scientific Crop Circle sensor were used when the corn was about 6 leaf and again about 2 weeks later over the top, and at the later season also below canopy height. These sensor readings were taken to try to develop a predictive measurement to guide growers in the need for added N at side-dress time. The site yield and N-rate evaluations were evaluated as a whole and partitioned based on regional and soil considerations. The response of corn to N rate from the total of the two years is shown in Figure 1. 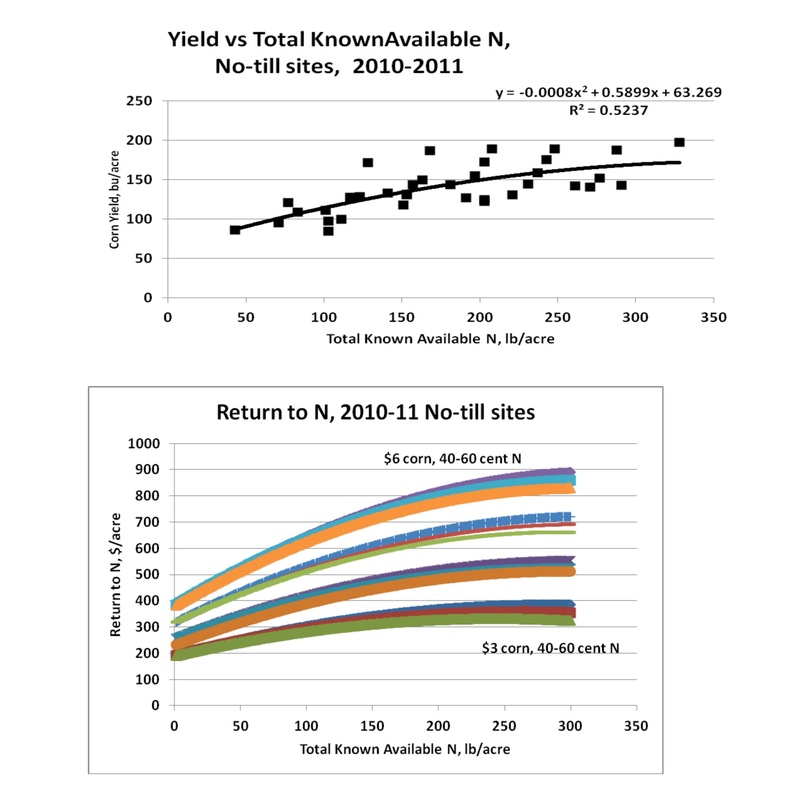 The relationship between total known available N and yield improves if west sites are removed. The relationship in the west is shown in Figure 2. The no-till sites, a total of 5 in the two years, responded differently than conventional sites, and the 50 lb/acre N long-term credit used in the spring wheat and durum recommendations appears to be justified for corn as well (Figure 3). 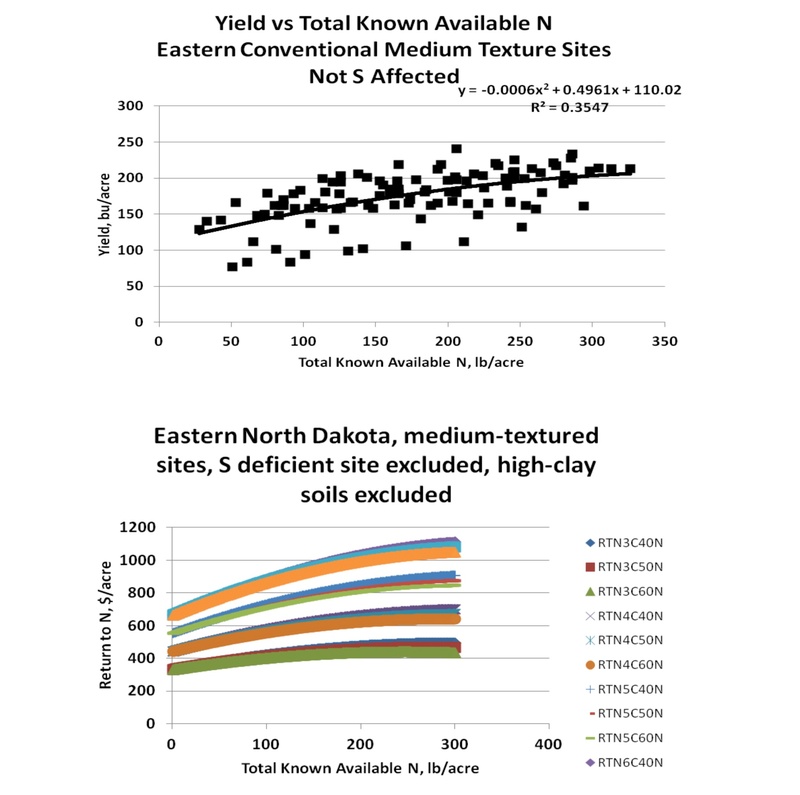 Clay sites (Figure 4) required far more N for similar yields as the remaining eastern ND sites. 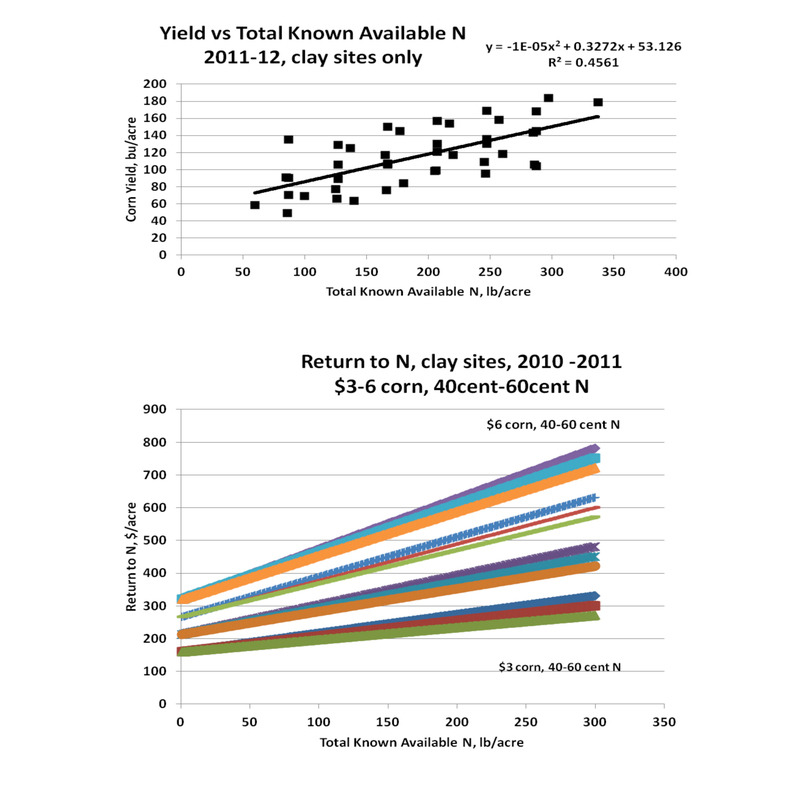 Based on a comparison of similar yields from the rest of eastern ND, clay sites lost about 80 lb N/acre in 2010 due probably to denitrification and more than 120 lb N/acre in 2011. The well-tiled clay sites were less affected by N loss and responses to N neared those of medium-textured soil sites in the east (Figure 5). Considering the amount of N lost in high clay soils in 2010 and 2011, and probably by growers in many springs, there is ample cause to begin recommending a planned side-dress N application in high clay soils. 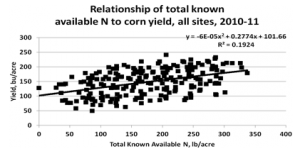 The alternative is applying very large applications of N, which if N losses do not occur may set growers up for stand losses due to green-snap or nutrient imbalances. There is still an enormous amount of sensor data to analyze, and a supplemental report of these data will be submitted in mid-winter. The plan for the project is for two more years of field work in 2012 and 2013, with final analysis conducted in 2014 resulting in new, revised corn N recommendations.